I have been interested in theater since at least fourth grade, when I began participating in my school’s plays. I am certain that before Boulder Ensemble Theatre Company‘s production of The Wolves I have never seen a play about nine high school-aged women — girls whose lives and struggles might have, at one point, resembled my own. 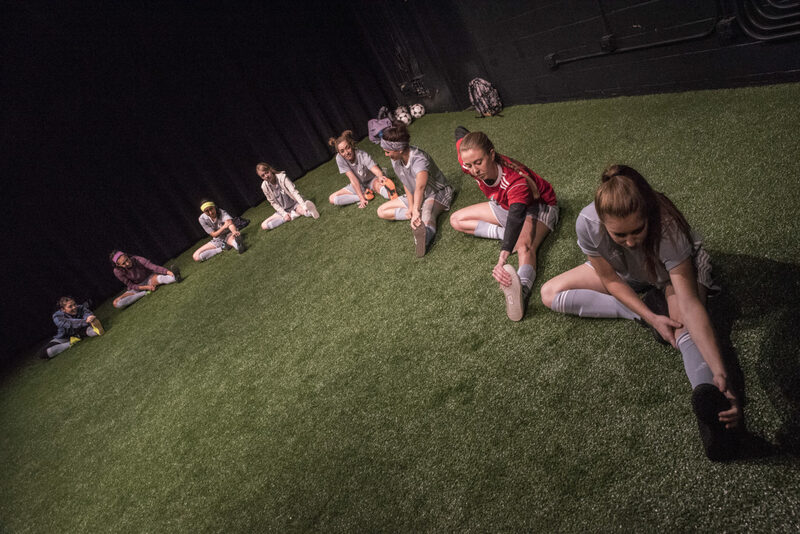 Playwright Sarah DeLappe’s Pulitzer Prize-nominated script introduces us to the Wolves, a female high school soccer team, in various moments throughout their season. It isn’t the matches we are concerned with, but the windows before and after the games — moments when the adults aren’t around and the girls can speak freely. As the Wolves (identified in the program only by the number on their jersey, as if to remind us that these are athletes as much as they are women) stretch, drill and strategize, we overhear what we might expect: digs about their brothers, jokes about tampons, light debate over Social Studies topics. If DeLappe stopped there, The Wolves would manage to be interesting. The playwright displays a keen ear for authentic dialogue, even allowing the girls to organically carry on multiple conversations at once in a complicated but never confusing circus of non-sequitors. This type of conversational choreography struck me as fresh and real. And DeLappe goes farther, creating a group of friends sharing varying levels of intimacy. They know each other’s families, they hang out on the weekends — but as is the way with women this age, we learn nearly every player is harboring a secret, a struggle, a wound. This is as far as I will take you regarding the plot, as the slow and gentle unraveling of these stories and secrets is the true magic of The Wolves. BETC’s production is clean and solid. As you might imagine, this story lives and dies by its casting, and director Rebecca Remaly’s cast is outstanding: nine believably teenaged actresses able to whip between silly and tender, eye-rolling and fierce. The set design (Tina Anderson) is fittingly bare bones; the AstroTurf field rolls right up to the Carsen Theater’s seats, keeping the audience in the middle of the action — and constantly on watch for a stray ball. At a glance, Brenda King’s costume designs amount to standard soccer kit, but the longer you watch the more individual detail you will spot on each player. Even the sound design is engaging; Ashley Campbell has peppered in the “skip” sound of an iPod Shuffle (or a TiVo, to split hairs, but the intent is clear) as the music abruptly flicks from Childish Gambino to Imogen Heap, as though the girls themselves were idly skimming their own music. I attended a preview performance and the full house reflected a wide mix of ages — it is exciting to think that a new generation has voices like DeLappe’s to listen in on. Remaly has concocted a beautiful production of a moving play I would have loved to perform in half a lifetime ago — and with an all-female cast and predominately female production crew I wouldn’t have even known to dream about. With any luck, The Wolves is a sign of great things to come.